The Diamondbacks have acquired right-hander Matt Andriese from the Rays, The Athletic’s Ken Rosenthal reports (Twitter link). Robert Murray, also of The Athletic, was the first to report that Tampa and Arizona had a trade in place. The Rays will receive two minor leaguers in return — catcher Michael Perez (as per Marc Topkin of the Tampa Bay Times) and righty Brian Shaffer (as Rosenthal was the first to report). In a corresponding move, the D’Backs announced that right-hander Randall Delgado has been designated for assignment to create a 40-man spot for Andriese. Despite the ever-shifting roles, Andriese has been largely successful in Tampa, including a 4.07 ERA, 8.9 K/9, 50.6% grounder rate, and 3.28 K/BB rate this season over 59 2/3 innings, plus a career-best 11.4% swinging strike rate. It represents a nice rebound from an injury-filled 2017, as Andriese was limited to 86 innings (starting 17 of his 18 games) due to hip and groin problems. The D’Backs have dealt with their own share of pitching injuries this season, though things have somewhat stabilized with a regular starting five of Zack Greinke, Patrick Corbin, Robbie Ray, Zack Godley, and successful bounce-back project Clay Buchholz. Still, with Ray and Godley both delivering inconsistent results, Andriese gives the Snakes some extra rotation depth, as well as a valuable durable arm for the bullpen. Andriese will be eligible for arbitration for the first time this winter, and thus the D’Backs had to surrender a not-overwhelming but decent prospect package for Andriese’s three years of control. The 2018 Baseball America Prospect Handbook ranked Perez as Arizona’s 30th-best minor leaguer prior to the season, with MLB.com ranking Shaffer 23rd in their current top-30 ranking of the Snakes’ system. Perez, 25, has long been heralded as a strong defensive catcher, and he has begun to make some strides at the plate over the last two seasons at the Double-A and Triple-A levels. In 250 career PA at Triple-A, Perez has a solid .291/.348/.445 slash line, though that is both a rather small sample size and perhaps a product of the hitter-friendly Pacific Coast League. Even without a big bat, however, Perez still projects as a potential glove-first backup catcher type, which is useful for a Rays team that has long looked for consistency behind the plate. Topkin reports that Perez will join the Rays’ roster on Thursday for his first taste of Major League action. Shaffer was a sixth-round pick for the Diamondbacks in the 2017 draft. MLB.com’s scouting report cites the 21-year-old’s slider as his best pitch, and he also possesses a fastball that has touched 94mph. Shaffer has delivered good results in his brief pro career thus far, including a 2.70 ERA, 9.2 K/9, and only a 1.8 BB/9 over 106 2/3 frames at the A-ball level this year. Between this trade and sending Nathan Eovaldi to the Red Sox earlier today, the Rays have continued to churn their roster, even while falling short of an actual rebuild. Indeed, after today’s win over the Yankees, the Rays are now 52-50 for the season, though they are still realistically out of the pennant race (8.5 games back of the last wild card slot). In the short term, Tampa finds itself short two valuable arms for its pitching mix, as it remains to be seen how the Rays’ pitching strategy will continue to evolve without Andriese and Eovaldi around to cover innings. This represents the third major trade between the Rays and D’Backs in under a year, after the offseason deals that saw Brad Boxberger come to Arizona and the three-team deal (also involving the Yankees) that most notably saw Steven Souza go to Arizona and Brandon Drury head to New York. The Rays have designated infielder Taylor Featherston for assignment, optioned righty Chih-Wei Hu to Triple-A and activated right-hander Matt Andriese from the disabled list, tweets Bill Chastain of MLB.com. Featherston, 27, was acquired in the middle of the year from the Phillies. He has seen limited time this year at the major league level, batting .179/.277/.359 in his 47 trips to the plate. He has continued to struggle at the plate in the upper minors, too, posting a cumulative .248/.329/.386 slash in his 280 plate appearances at Triple-A between the two organizations. Though Andriese functioned as a starter earlier in the year, he’ll work from the pen at least initially, Marc Topkin of the Tampa Bay Times tweets. Andriese, who turns 28 today, turned in a dozen quality outings (3.54 ERA, 8.1 K/9, 3.1 BB/9) earlier this season and ought to represent a notable addition to the staff down the stretch. Rays right-hander Matt Andriese has been diagnosed with a stress reaction in his hip, reports Marc Topkin of the Tampa Bay Times (Twitter links). The injury will likely sideline him into the month of August, according to Topkin. Well-regarded prospect Jacob Faria has been recalled to start in place of Andriese this week and could be in line for a long-term audition in the rotation. Per Topkin, Andriese needs a “few weeks” off his hip before he’s able to begin a throwing program and then build up arm strength. There’s no fracture in the hip, and Andriese will not require surgery. Andriese, 27, may not carry much name recognition among casual fans, but he’s been a key member of the Tampa Bay rotation thus far in 2017. Through 61 innings, he’s logged a 3.54 ERA with 8.1 K/9, 3.1 BB/9 and a 46.4 percent ground-ball rate. That performance had earned him a definitive spot in the Tampa Bay starting five after splitting time between the rotation and bullpen a year ago. With Andriese out for upwards of two months, it seems that the Rays will deploy a rotation of Chris Archer, Jake Odorizzi, Alex Cobb, Erasmo Ramirez and Faria for the time being. Top prospect Jose De Leon is on the disabled list in Triple-A with a right lat injury, so he isn’t an option to step up for the time being. Southpaw Blake Snell has been excellent since being optioned to Triple-A earlier this year, but the Rays, at least for now, seemingly want to see sustained success out of the longtime top prospect before bringing him back up to the Majors, where he struggled to begin the year. As for Faria, you’d be hard-pressed to argue that the 23-year-old hasn’t earned a lengthy look in the Majors. Through 58 1/3 innings of Triple-A work this year, he’s pitched to a 3.07 ERA with 12.9 K/9, 3.4 BB/9 and a 41.5 percent ground-ball rate. He’s already made his big league debut with the Rays as well, making a spot start last week during which he limited the White Sox to one run on three hits and two walks with five strikeouts across 6 1/3 innings. The Rays will call up top pitching prospect Blake Snell for a start on Thursday, manager Kevin Cash told reporters (including Roger Mooney of the Tampa Bay Times). 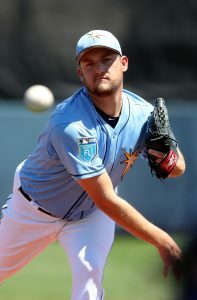 Righty Matt Andriese, who has a 2.82 ERA over seven starts for the Rays this season, will be shifted into a fireman role in the bullpen. This is the second time Snell has been promoted, as the 23-year-old southpaw was called upon for a spot start against the Yankees on April 23. Snell looked good in his MLB debut, holding New York to one run on two hits and a walk over five innings, recording six strikeouts along the way. He was returned to Triple-A Durham afterwards, where he has enjoyed an impressive season: 3.29 ERA, 12.9 K/9 and a 3.21 K/BB rate over 63 innings. Cash gave no indication as to how long Snell’s latest stint the Tampa rotation could last, though as Mooney notes, Snell won’t amass enough service time to attain Super Two status should he remain on the Major League roster for the rest of the season. That being the case, there’s little reason the Rays wouldn’t keep the lefty around if he pitches well. It may be unfair to solely attribute financial reasons to Snell’s minor league stay, of course, as he has exhibited some control issues over his pro career — 28 walks over his 63 Triple-A innings this season and a 4.4 BB/9 over his 485 frames in the minors. An extra bit of Triple-A seasoning also may have been warranted simply due to the fact that Snell (while picked 52nd overall in the 2011 draft) was somewhat of a middling prospect before his breakout 2015 campaign. That massive season saw Snell jump three levels in the Rays’ farm system and land himself a prominent spot on the preseason prospect rankings lists (ranked 12th by Baseball America and MLB.com, 14th by ESPN’s Keith Law, 21st by Baseball Prospectus). Snell’s continued success this year, however, earned him that April start and now what could be a prolonged look in Tampa’s rotation. The Rays entered the season expecting to be led by their starters, though only Jake Odorizzi and Andriese have performed consistently well. Chris Archer (4.61 ERA), Drew Smyly (4.94) and Matt Moore (5.56) have all had their share of struggles, though advanced metrics indicate that all three are significantly outperforming their inflated ERAs. Andriese’s 2.82 ERA, by contrast, has perhaps a bit fortunate, as ERA predictors (3.22 FIP, 4.25 xFIP, 4.42 SIERA) paint a less flattering view of his performance. Andriese doesn’t miss many bats (6.04 K/9) and relies on grounders and soft contract to rack up outs. It’s not a dissimilar arsenal to that of Erasmo Ramirez, who has also pitched quite well for Tampa in a fireman role this season. Having a pair of versatile, multi-inning relievers could provide a boost to a Rays bullpen that has been plagued with injuries, most notably closer Brad Boxberger spending almost the entire season on the DL.